Include a wide variety of vegetables in your complete nutrition plan to reap the health benefits that vitamins, minerals, fiber, and phytochemicals can provide. Eat two to three cups of vegetables per day to help fight off cancer, cardiovascular disease, type 2 diabetes, cognitive decline, age-related eye diseases, and other afflictions. Research suggests that a vegetable-rich diet can lower your risk of certain types of cancer, cardiovascular disease, type 2 diabetes, cognitive decline, age-related eye diseases, osteoporosis, lung diseases, and chronic inflammation. That’s why the USDA MyPlate guide, which has taken over the traditional role of the food pyramid, suggests that adults include two to three cups of vegetables each day in their healthy meal plans for complete nutrition. In addition, many vegetables are considered fat-burning foods, since your body expends more calories to break down and digest them than they contain. If you are trying to lose weight or prevent weight gain, foods in the vegetable family can help you achieve your goal. When it comes to veggies, the more variety, the better. By choosing from the rainbow-hued spectrum of vegetables, you will get a wide array of nutrients and phytochemicals, plant nutrients that have antioxidant and anti-inflammatory actions. If you’re eating the same five or six vegetables week in and week out, you may not be getting the complete nutrition you need. Expand your dietary horizons and put a few new varieties on your healthy grocery list each week. 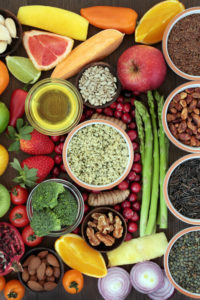 Although all vegetables are superfoods, here we provide more nutritional information on some that rank among the cream of the crop when it comes to a complete nutrition diet. Asparagus. Asparagus spears are packed with nutrition; they provide the most folic acid per serving in the vegetable world along with potassium, fiber, protein, other B vitamins, and minerals such as copper, selenium, manganese, zinc, and iron. Asparagus also contains powerful phytochemical compounds: rutin, which helps strengthen capillary walls; the “master” antioxidant, glutathione, which supports immune system function and aids in removing toxins from your body; the fiber inulin, which is known for colon health; and saponins, which have been linked to blood glucose and cholesterol control. Avocado. Avocados contain healthy, unsaturated fats linked with heart protection, along with fiber, vitamins, minerals, and phytochemicals. While a calorie-counter may bypass avocados, research has shown that including avocados in your diet can in-crease satiety (fullness) and provide weight control benefits. One ounce of avocado contains only 50 calories but provides a multitude of health-protective nutrients, including vitamins K, C, and E, folate, phytosterols, and many phytochemicals. Broccoli. Broccoli provides high levels of vitamins A, C, and K, folic acid, and fiber, as well as some protein and omega-3 fatty acids. In addition, broccoli and other cruciferous vegetables contain phytochemicals called glucosinolates, which have cancer-fighting potential. Hundreds of studies have found that broccoli may reduce chronic inflammation and oxidative stress, which may help ward off cancer. Broccoli and carrots offer vitamins A, C, and K as well as fiber and all sorts of other health benefits. Carrots. Carrots are very high in vitamin A (113 percent of the recommended daily value), as well as biotin, vitamins B6, C, and K, fiber, and potassium. In addition, they have many phytochemicals, such as carotenoids (including alpha-carotene, beta-carotene, and lutein) and anthocyanidins. Studies have linked carrot consumption to cardiovascular health, vision health, and cancer protection. Are tomatoes a vegetable… or a fruit? In a way, both are correct answers. Botanically, the tomato—which is native to the Americas—is a fruit. But the U.S. Supreme Court ruled it a vegetable in 1893. An import tax protected U.S. farmers from foreign-market competition. Either way, tomatoes are known to be a source of vitamin C, vitamin A, potassium, fiber, and lycopene (which is thought to have cancer-fighting benefits). Tomatoes. Tomatoes contain a variety of nutrients, including vitamins A, B6, C, and K, biotin, copper, potassium, manganese, and fiber. In addition, tomatoes are the richest source of the phytochemical lycopene, which paints its flesh bright red. Lycopene has attracted the attention of nutrition researchers for its powerful antioxidant and anti-inflammatory actions. In particular, tomatoes seem promising in the protection against prostate cancer and possibly breast cancer, as well as heart disease, UV-related skin damage, and osteoporosis. Some vegetables are higher in carbohydrates and starch than others. Starchy vegetables include potatoes, winter squash (acorn squash, butternut squash, spaghetti squash, Hubbard squash, and others), corn, peas, and most types of beans. These foods are good sources of important vitamins and minerals, just like vegetables that contain fewer carbs. However, higher carbs means a higher calorie count. This does not mean you need to avoid these vegetables, but it’s wise to limit the amount you eat. Here’s a good nutrition tip: When it comes to meal planning, put starchy vegetables in the same category as rice, pasta, and bread, and have only one food from this category per meal. For example, have potatoes and asparagus rather than potatoes and corn, or acorn squash and a salad, rather than acorn squash and pasta. Pairing starchy vegetables with vegetables lower in starch will help you increase your overall intake of vegetables while reducing the chance of overloading on higher-calorie choices. By including both starchy and non-starchy vegetables in your diet plans, you’ll get a wide range of nutrients that have been linked with many health benefits. 2 diabetes, anti inflammatory, antioxidant, b vitamins, beta carotene, biotin, bone, bone health, breast cancer, calcium, calorie counter, calories, cancer, cardiovascular, cardiovascular disease, cardiovascular health, carotenoids, carrots, cholesterol, cholesterol control, chronic inflammation, cognitive decline, colon health, complete nutrition, corn, cruciferous vegetables, diabetes, diet, diet plans, eye diseases, fat burning foods, fiber, folate, food, food pyramid, glucose, glucosinolates, good nutrition, health, healthy grocery list, healthy meal plans, heart disease, immune system, inflammation, iron, Lose Weight, lung diseases, lycopene, magnesium, nutrients, nutrition, nutrition diet, nutrition plan, nutritional information, omega 3, omega 3 fatty acids, osteoporosis, oxidative stress, potassium, potatoes, Prostate, prostate cancer, protein, selenium, skin, spinach, stress, toxins, type 2 diabetes, types of cancer, vegetables, vision health, vitamin, vitamin a, vitamin c, vitamins, vitamins and minerals, vitamins minerals, weight control, weight gain, weight gain foods, zeaxanthin, zinc.